Savannah. Even simply saying the name compels you to take your time by rolling over her syllables as if to savor the city like a cherished slice of her famous pecan pie. Savannah. The destination denotes a sense of Southern sophistication in which residents place an aesthetic emphasis and a distinctive Georgian drawl on the second syllable of "lifestyle." In keeping with its namesake-s notable and often-written-about charm, Savannah Quarters has fashioned each of its communities: Westbrook, the Village and Easthaven-to be an affordable means to living "in high cotton." "Savannah Quarters is a collection of complementary neighborhoods with a wide range of home products and price points that exist in an architectural master plan that is modeled on the historic and beautiful city itself," begins Karl Strauch, the development's director of marketing. "The lifestyle is casual and effortless, with a small town warmth and feel." Set on 2,600 acres, Savannah Quarters demonstrates true Southern hospitality by extending a warm welcome to an array of potential homeowners. From estate-sized homes to second home villas to quaint cottages to maintenance-free town homes, every person and preference can find the perfect place to sip on some sweet Savannah tea and enjoy coastal living as its best. 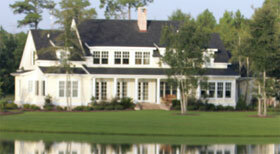 Without a doubt, the crown jewel of Savannah Quarters is the private golf club community of Westbrook, which includes an array of architectural districts" comprised of estate-sized custom homes and home sites, cottage-sized homes, Westbrook Villas and a traditional neighborhood design concept appropriately named Traditions. New-home buyers can find additional Savannah-style options in the single-family home neighborhoods east of Pooler Parkway in Savannah Quarters-collectively referred to as Easthaven-or in The Village, a mixed-use residential, shopping and business complex adjacent to Westbrook. Featuring home sites between $100,000 and $250,000 and completed homes from $380,000 to $2.5 million, Westbrook is not only a sweet slice of pecan pie but gives you ample opportunity to work off the calories with its deluxe country club amenities. The brand new 18-hole Greg Norman Signature Golf Course opened Labor Day 2006, joining the pro shop, Har-Tru tennis courts, swim and fitness center, playground and Club Grille. And the Savannah Quarters Country Club recently broke ground on a 29,000-square-foot clubhouse expected to be completed in time for 2007 holiday parties. The Village is comprised of the Town Homes of Village Green and Carrington Square Apartments and backs up to The Westbrook Villas. The Village combines town home, villa and apartment living with upscale retail and office spaces, creating a cosmopolitan feel that encourages people to get outside and into their daily routine by enjoying boutique-style shopping and café-style eateries and coffee houses. "All the town homes have great views looking out over the live oak-lined village green or a lake within the Village of Savannah Quarters," says Karen Jenkins, development director at Savannah Quarters. The town homes of Village Green feature luxurious and maintenance-free two-story floor plans, including hardwood and ceramic flooring, Corian counter tops and crown molding throughout. Equally impressive, Easthaven-s The Gates, a CraftBuilt neighborhood, provides seven models ranging from 1,700 square feet to more than 2,300 square feet, priced from the $240s. 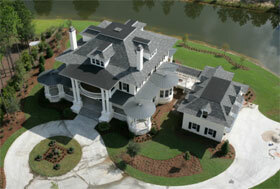 Each model includes beautifully appointed flooring, cabinetry and other upgrade options. Strauch describes The Gates as "a single-family-home residential gated neighborhood with its own clubhouse and pool amenities center." Much like Westbrook, The Gates residents are encouraged to appreciate the great outdoors by taking advantage of the well-planned walking and biking trails, as well as the nearby children-s playground. The second neighborhood on the Easthaven side is Hamilton Grove, by Centex Homes, which provides another viable option for single families. Prices range from the $160s to $225,000. Residents here may also opt for the outdoors by walking and biking or gearing up for a down-home picnic in the park, complete with fried chicken and cornbread. Although each neighborhood is distinctive, Savannah Quarters in its entirety fits together like a puzzle, resulting in an image of Savannah at its finest. "We refer to the overall product here as Savannah Style," Strauch says. 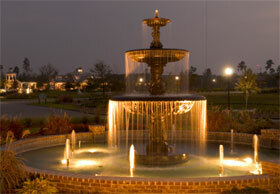 "It-s more of a community lifestyle than a particular home product or price point. Savannah style can be had here in a range of prices." Jenkins explains, "Architecturally, all homes in Savannah Quarters are strongly encouraged to be true to the traditional Lowcountry style, with an emphasis on elements from the Savannah and Georgia Lowcountry idiom. This includes Antebellum, Plantation, English Colonial, Spanish Colonial, French Country, Italianate, Greek Revival and Gothic Revival styles-many of the architectural styles found in the Savannah Historic District." Betsy Howard, a graduate of the Savannah College of Art and Design with a master's of fine arts in Historic Preservation and a realtor specializing in luxury homes, feels Savannah Quarters is getting it right. "The architectural standards they are maintaining and the quality of the homes being built in the Westbrook neighborhood are impressive," she says. Examples can be seen in common areas and the homes themselves. They are found in the wrought iron and brick entrances for each of the neighborhoods, the styles and the detailing of windows, porches and shutters and the fountains and gazebo centerpieces at traffic circles. 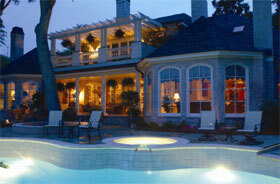 Even the landscaping is meticulous and authentic in the use of magnolias, crepe myrtles and live oaks. To maintain its refined and relaxing feel, each neighborhood has its own homeowners association, but all the associations promote the news and events of their own as well as of other neighborhoods. For example, residents of The Gates might learn about a pool party at Hamilton Grove, an open house at Westbrook or a sale in the Village. Another factor that makes Savannah Quarters so spectacular is that it is the byproduct of a single developer-Medallist Developments, a joint venture of golfing great Greg Norman's Great White Shark Enterprises and Macquarie Bank. Many master-plan developments sell large tracts of land to other developers or builders, leading to inconsistency in the use of land or the synergy of the community-s look and feel. "This is not the case with Greg Norman," says Bill Gilbert, senior project manager at Savannah Quarters. "He didn-t just design a great golf course here; he and Medallist are implementing a vision for the whole community." Unrivaled and undeniably Savannah in style, Savannah Quarters speaks of the past and sets a precedent for the future by respecting its culture and responding to its environment. Buffered by nature preserves and low-density living, this quintessential coastal community is surrounded by an explosion of population growth and opportunity yet remains quiet and tranquil. Savannah Quarters is located one exit west of the I-95 corridor on I-16, within an hour of the beaches of Hilton Head to the north and St. Simons Island to the south and minutes from downtown Savannah and the Savannah/Hilton Head Airport. To learn more about Savannah Quarters, visit www.savannahquarters.com.